JASK is the brainchild of Shaun Delaney, who has nurtured and improved on the original game concept, after developing it for his three wonderful daughters. The girl’s inspiration and motivation in the years to date has been the driving force for JASK to be brought to the market. Its name is derived from their names; Justine, Abby and Kerry, and of course, Shaun’s. JASK evolved from rain-affected holidays to Devon and Cornwall. Shaun set about keeping the girls amused, while at the same time trying to broaden their knowledge. Horrified at certain gaps in their education, he developed a way of mixing general trivia with more meaningful questions. The girls demanded ‘Our quiz must be turned into a game’. This Shaun did by inventing a board with letters printed on each square. He then formulated the strategy side of the game, which in turn increased the competitive, educational and fun element. JASK led to increased debate and discussions about varied subjects. As with any intellectual game a child’s/teenager’s capacity for learning and thought process is boundless. 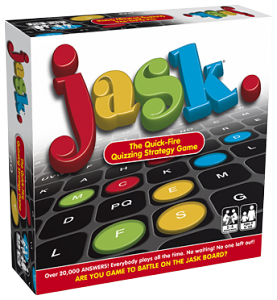 These processes are superbly demonstrated and answered by playing JASK. Shaun devised a method of scoring (including a tougher one for the more proficient players), firstly to eliminate the element of luck when using a dice, but more importantly, to allow players of all ages to have an equal chance of winning. 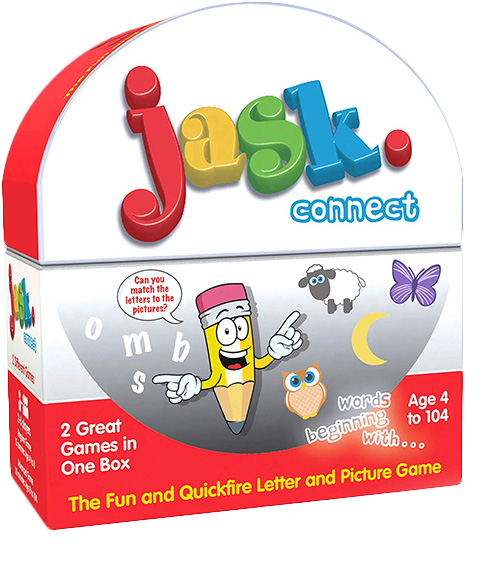 This makes JASK an ideal game for both adults and children, or for a mixed age group. At the start of the game, and each round, a card is selected. Players will have one or more counters positioned on different letters on the board. All players/teams have one minute to think of as many answers for the selected question using a letter on which one of their counters is positioned. Answers are scored, thus allowing each player to move their counters towards their home. Strategic moves can knock players’ counters off and back to the start. The first player to get all their counters home is the winner!! JASK is a dynamic game that will prove to be timeless, as all the questions can be answered by all players of varying ages and abilities, now and in the future.